This week I received a letter in the mail—a very special letter from a stranger. The writer spends every week at the gate where my guitars are on display at YVR Airport. They have become part of his commute to work in Whitehorse. I am humbled by his words and grateful that these instruments can provide encouragement for others to create art. I am writing to express my incredible appreciation for your work. You have taken a guitar past craftsmanship and into artwork. I have had the great pleasure of being able to view your two guitars at the Vancouver Airport twice a week for the last few months. I work in White horse Monday to Thursday and I'm always at the gate with your work. In fact I'm sitting beside them as I write this. The OM Bubble Quilt Maple "Blue Velvet" is my favourite (if only I could play it). 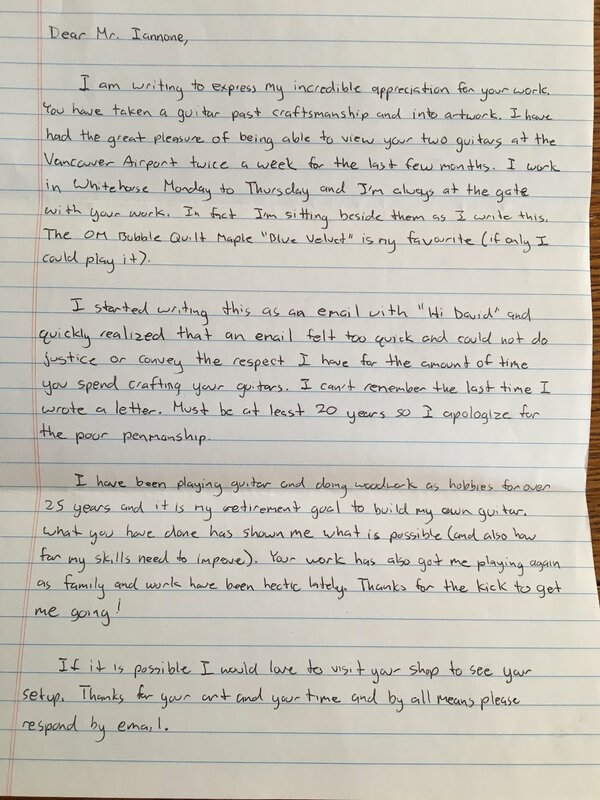 I started writing this as an email with "Hi David" and quickly realized that an email felt too quick and could not do justice or convey the respect I have for the amount of time you spend crafting your guitars. I can't remember the last time I wrote a letter. Must be at least 20 years so I apologize for the poor penmanship. I have been playing guitar and doing woodwork as hobbies for over 25 years and it is my retirement goal to build my own guitar. What you have done has shown me what is possible (and also how far my skills need to improve). Your work has also got me playing again as my family and work have been hectic lately. Thanks for the kick to get me going! If it is possible I would love to visit your shop to see your setup. Thanks for your art and your time and by all means please respond by email.